Sitting on my living room couch with the front door open to welcome in the warm, fresh, Southern California air, I was settling into my afternoon routine: some social media posts, folding laundry, and cat cuddles while my lunch was being warmed in the oven. My security screen door was locked, and the way the light hits it I can see out but you can’t see in during daytime. I have a “No Soliciting” sign on it that I made myself, because my location near the park unfortunately draws LOTS of unwanted solicitors. Some of them are so pushy and rude, some are super shady- I rarely open that door and usually just say, “No thanks” from the safety of my couch. Today, the skip-shuffle footsteps and sing-song chatter of a skinny little boy made it up my front steps, looked intently at my sign, and proceeded to knock. He reached his skinny little arms up and knocked right on the sign. I was laughing to myself as I watched, and then I answered him in my sweetest mom-like voice as I went to the door. “Hello!” I said. “Hello, would you like to buy some cookies?” he asked shyly. The clear plastic box full of individually wrapped cookies was balanced precariously on his hip, the dirty white lid removed and lying on my porch. He could not have been more than 6 or 7 years old, big brown hopeful eyes and a crooked-tooth smile. I LOVE ENTREPRENEURS. And cookies. And super cute kids. Definitely going to eat cookies for lunch now. “Well, those look good,” I said, looking around to see if there was a nearby parent. I saw a slightly older girl across the street, pitching her cookie sales to my elderly neighbor. No parents in sight, which always makes me wary and a little worried for the kids, even in a nice neighborhood like mine. 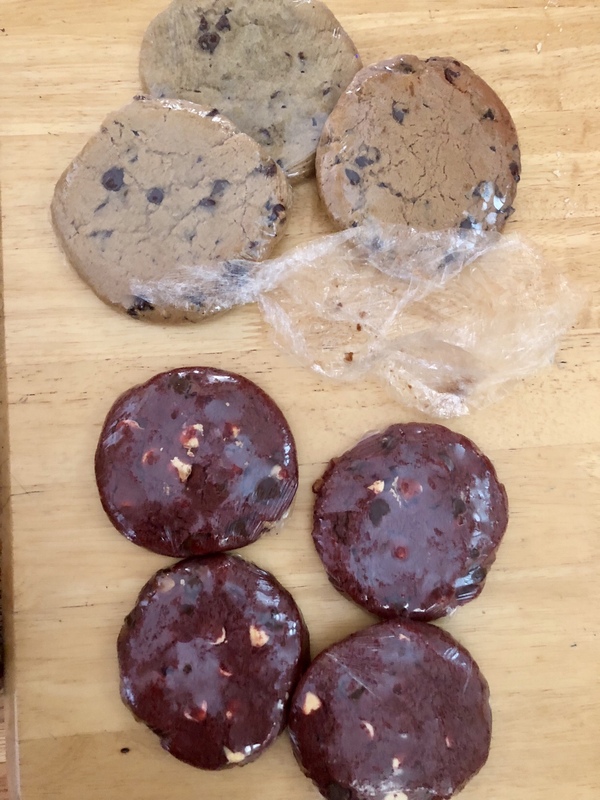 “What kind of cookies do you have there?” I asked. “I got Red, um, Red Velvet, and Chocolate chip. 1 for a dollar, 3 for 5 dollars, or 8 for 20 dollars. That’s the Best one!” He said proudly. Nice pitch, kid. “Hm, that does sound good. Did you make these?” I asked. “Mm hmm, yes. And the 8 is the Best! You can have some today AND tomorrow, or you can share them,” he said. No parents in sight, but he had a good sales coach somewhere. My heart. Then the questions flooding my mind: This sweet baby is thirsty, and how long has he been out here today selling cookies? Where are his parents? Where does he live? Why isn’t he in school? How can i help them? I told him I don’t have sodas, but I would look for some juice for him. I took my 8 giant cookies and left him standing on the porch while I raided my fridge and cupboards for some food to give him. I loaded a bag with fresh fruit, some snacks, and a bottle of apple cider that didn’t get opened on Christmas. By this time, Shemar’s older sister had come over to join him on my front porch. They looked clean, and their clothes were in good shape, and they were very sweet and polite kids. They gathered up their boxes of cookies and headed off down the street to make their next sales. I opened one of the cookies and devoured it while writing this post. If nothing else, I hope that they will know that they are cared for, and I hope they never lose their entrepreneurial spirit.